India has always been a blessed land where the great God’s incarnations (awatars), the great realized souls, the Maharishis, the saints & the philosophers were born and reincarnated from time to time, whose great deeds & ideals are immortal sources of guidance for the aspirants to lead a life of unfathomable depths and unimaginable heights. The great souls/saints like Lord Budha, Adi Shankar, Baba Gorakhanath, Guru Nanakdeo, Kabir, Mira Bai, Namdeo, Sant Tukaram, Sant Gyaneshwar, Swami Vivekananda and many more besides Lord Rama and Lord Krishna who have left unforgettable ideals for the society to follow and inspirations for the humanity. In that tradition Lord Shiva [Shri Amrit Nathji Maharaj] reincarnated as Shri 1008 Shri Amrit Nathji Maharaj in the Shekhawati region of Rajasthan who left his physical body in the year 1915 after having declared it a year before. He left an everlasting impact on the society due to his unique, divine and miraculous life. The Shekhawati region is fortunate enough to have attracted many realized souls (Jivan muktas) to reincarnate and get the divine and blissful company of Shri Amrit Nathji Maharaj. 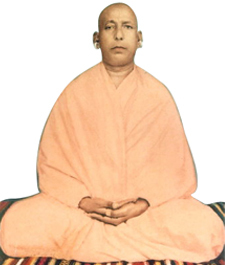 In that lineage of jivan muktas Babaji Shri Shraddha Nathji Maharaj, the most venerated Nath Siddha yogi, was born as a unique child on the auspicious day of Rath Yatra of Bhagwan Jagannath Puri in 1918 at village Panlawa in Laxmangarh district in Rajasthan. At the time of birth the baby was having a glow on his face and a red tilak on his forehead and size of the baby was much larger than a normal child. The baby was given a favorite name Narayan (God in human form). Narayan was reincarnation of his father’s Guru, Baba Tilakdhari, who had promised to visit Narayan’s father’s home and now by being born in the family had fulfilled his promise. Baba Tilakdhari used to have a red tilak on his forehead and Narayan was born with the same tilak. Narayan grew up and later on came to be known as the famous Shri Shraddha Nathji Maharaj. During childhood from the age of three onwards Narayan had shown unique divine powers and vachan siddhi (i.e. whatever he used to say, it used to come true). Narayan lost his father soon after attaining the age of 8 years. This incident at such a tender age did not bring even a tear in Narayan’s eyes; he neither wept nor had shown any sign of shock, sorrow or attachment. On the other hand like a matured elderly person he consoled his weeping mother, grandfather and other family members. Such was the level of his attitude towards renunciation even at this early age. The red Tilak on his forehead remained for many years and there after the Tilak was not visible to all the people all the time. One day after expiry of Narayan’s father, his grand father called him and said, “Son! I know one day you are going to be a saint (sanyasi) but until I am alive please do not leave this house.” Narayan followed his instructions and became a sanyasi at the age of 36 years only after his grand father passed away. Similarly his mother also said “Son you are destined to become a saint but please promise me that you will continue to visit me occasionally until I am alive”. Narayan even after becoming a Nath Yogi by the name Shri Shraddha Nathji Maharaj honoured the word given to his mother and continued to visit until she passed away. After attaining the age of 12 years, Narayan adopted the village temple as his place of sleep instead of home due to his thirst for loneliness (ekantwas) to plunge deeper and deeper in spiritualism. He had a separate room in the temple for doing his sadhana. During daytime he used to attend to his duties towards his mother & grandfather and in the night, he used to concentrate on enhancing his spiritual knowledge besides taking rest. This routine continued for next 12 years. He did not go to any school for his education. He simply learnt the Hindi alphabets from one Panditji, but his knowledge on any subject was so deep that even the highest educated person used to feel very little before him. Every type of knowledge on any subject was within his reach and transparent to him. Once one educated Mauni Baba at Jodhpur was astonished to see the depth of his knowledge and asked him about his level of formal education acquired. He replied, "I have read the open book of the University of Nature (God) pertaining to this universe without any formal education. Whatever I know is through personal experience in the society by reading the Nature’s open book." After completing 12 years in village temple, Narayan’s mind was fully detached from the external world. He started remaining engrossed in spiritual practices all the time. Contact with people was appearing as a disturbance to his sadhana, so he decided to stay away from people in a lonely place. Therefore away from the village in fields, high up on sand dune, he constructed a small hut and started practicing his sadhana day and night without any disturbance. With all the thirst for God realization, Narayan started having the strong desire to have a spiritual guru. He adopted Shri 1008 Shri Amrit Nathji Maharaj as his spiritual guru and had number of visions of Shri Amrit Nathji Maharaj. At that young age, Narayan spent all his free time among the saints. He soon came in contact with many saints; Govindnathji, who became Narayan’s best friend; Nawanathji, a great sidhha; and many others. He adopted Shri Subh Nathji Maharaj of Fathepur ashram as his guru. Shri Subh Nathji Maharaj was disciple of Shri Jyoti Nathji Maharaj who in turn was disciple of Shri Amrit Nathji Maharaj. Shri Subh Nathji Maharaj gave the name Shri Shraddhanathji Maharaj (or later also being addressed as Shri Babaji Maharaj) to young Narayan. Babaji Maharaj continued his sadhana in the fields for next 12 years. He attained Nirvikalpa Samadhi – the highest state where one attains complete union with Brahm. During these 12 years Babaji Maharaj also came in contact with his beloved disciple Shri Chunni Lalji Maharaj. He started visiting Chunni Lalji’s village Posani and would stay at the village dharamshala (guest house). After 12 years of intense sadhana and satsang with many renowned saints, Shri Babaji Maharaj spent next 12 years roaming around not just in Shekawati region but also across India and visited Dawarka, Rameshwaram, Haridawar, Rishikesh, Badrinath and many other places of pilgrimage. No matter where he went, Shri Babaji Maharaj would keep Nawalgarh or Posani dharamsala as his anchor place and would come to these places after every pilgrimage trip. During this time Shri Babaji Maharaj accepted the saffron clothing (sign of sainthood). He never touched money and always had immense love and compassion for poor and downtrodden. Shri Babaji Maharaj was never into miracles (although the nature was completely under his control including the eight sidhis), however many events took place which show His greatness, purity, compassion and love for entire humanity. Some of these events are described in the "disciples’ experience" section and others can be read in the book ‘Shri Shraddha Charitamrita’. At the instruction of Babaji Maharaj’s guru, Shri Subh Nathji Maharaj, foundation stone for Laxmangarh ashram was laid in 1972. Even after constructing the ashram Babaji Maharaj continued to wander in Rajasthan and beyond. He would visit his devotees or places of pilgrimage with his devotees. Householder disciples started flocking to Laxmangarh and for devotees Laxmangarh ashram became the place of satsang (spiritual companionship) and pilgrimage. The ashram was also a place for saints to come where they would be looked after and provided with food, clothing and place to rest. During this time he helped thousands of people and some such events, depicting His divine grace, as narrated by the disciples, are captured in the “disciples’ experience” section and in the book “Shri Shraddha Charitamrita”. One of the main annual event celebrated in the ashram was Shiv Ratri (Shiva’s night); disciples came in thousands and whole night chanting and bhajans were sung. The spiritual atmosphere was full of serenity and exhilarating; everyone enjoyed the continuous bliss. Babaji Maharaj was a complete celibate. He always considered every woman as His mother or sister and had immense respect for women. He was an asana siddha (perfected in posture) in “siddhasana”. He always sat in the same posture and devotees were surprised that no matter what time they come, they will always find Babaji Maharaj in the same posture and always with a divine blissful radiance on his face. Babaji Maharaj never believed in any publicity and any unnecessary conversation involving criticism or arguments was not permitted in the ashram. He said “the remedy to avoid the disease of ism/sects lies in understanding the self (atman)”. In His company no one ever felt bored, He kept the atmosphere lively and humorous but always had the conversation focused on spirituality. He knew everything and often devotees’ problems would be addressed without them even speaking about it. On August 21st Babaji Maharaj decided to leave his physical body and took Maha Samadhi. Although he is physically not present today, he always lives in the hearts of his disciples and devotees. He is our savior and He is our God and we bow to him thousands of time. He is personification of love, bliss and sympathy. Even today he is bestowing his grace on all in the same way as he did before.